Slick, cool, funny. Guy Ritchie is back with a bang! 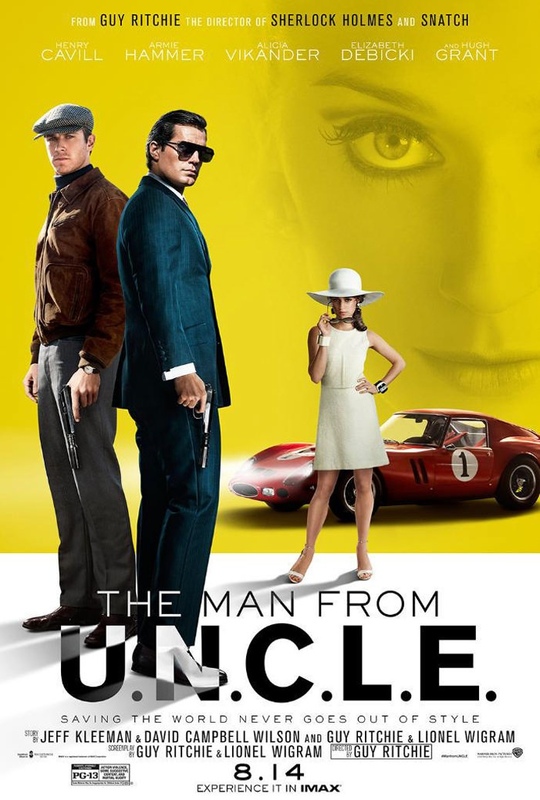 In the early 1960s, CIA agent Napoleon Solo (Henry Cavill – Man of Steel) and KGB operative Illya Kuryakin (Armie Hammer – The Lone Ranger) participate in a joint mission against a mysterious criminal organization, which is working to proliferate nuclear weapons. I know that this was based on the original TV show BUT I’ve never seen it so I can’t make comparisons on Ritchie and writer Lionel Wigram’s (Sherlock Holmes) adaptation. The first hour was action packed and reminded me of the spy movies of old. An elongated opening car chase ticked all the boxes (Even if it was hindered by shoddy CGI). It certainly injected the fun back into the spy genre. Now that the Bond films have gone in a darker direction, I felt the corny one liners and light humour was a much needed tonic. Giving the piece a nostalgia feel. Cavill was fantastic as Solo. The more I watched him steal the show, the more I thought to myself, “Bond”. Despite playing an undercover CIA asset, he would have been a perfect replacement. The looks, the charm and the charisma. But alas, the Justice League has claimed him as the Man of Steel for the foreseeable future. I loved the dynamic between the trio. They were perfectly cast. The fiery Alicia Vikander playing the reluctant mother to two sparring boys. Cavill and Hammer worked well together and made Solo and Kuryakin’s fractious relationship entertaining as hell. “This is not the Russian way!” It was good to see Hammer excel as ‘The Red Peril’ after the lacklustre Lone Ranger. The quick witted exchanges and uneasy tension kept me going (Through some of the sillier moments) with the pair constantly trying to get one up on each other at every turn. From their overcompensating gadgets and hotel room bug stand-off to dressing Gaby (Vikander) for her cover -“The shoes won’t match. They don’t need to match”. Vikander and Hammer had great chemistry as Gaby is reluctantly assigned to Kuryakin as his undercover fiancee. I just wish Vikander’s back story was more interesting. The story line involving her missing scientist father was a little weak. I loved how we only got tidbits of Solo and Hammer’s past. Jared Harris was wasted in his small supporting role as Solo’s handler Adrian Sanders. He delivered yet another another mangled accent BUT at least this one was better than his Irish rendition in that horrific Poltergeist remake. However, the second half of the film was where things went wrong. It was very clunky and disjointed. The tone was mismatched and took a much more serious turn that didn’t quite work. A highly macabre scene involving the pair bickering while their suspect was being roasted on an electric chair in the background was too much. Especially after the easygoing pace and playful banter. And tragically, the pace did get hampered by the plot. And for all its “complexities”; the story was far too predictable. Typical guff involving Nazis and the Cold War. Go, figure! It killed a lot of the fun and momentum that had kept me entertained for 60-odd minutes. The inevitable double bluffing and backstabbing between the team got a little long at the tooth for me. Elizabeth Debicki (The Night Manager) was wasted as the femme fatale Victoria Vinciguerra. She did her best with the role but was left in the background far too much. Only coming back for the frantic finale. The same can be said for Hugh Grant (Four Weddings and a Funeral). God, he’s looking old. He wasn’t in it enough. His renowned bumbling and quick witted exchanges a welcome return; “For a special agent, you’re not having a particularly special day, are you?”. The finale brought everything back into play and made up for a stumbling middle act with a mad dash explosive climax and (Hardly a spoiler!) it left things open for another. One sequel I would look forward to watching. If Ritchie and co can just trim the length, get a better baddie then we’ll be good to go. BUT this is still worth a watch if you’re in for the mood for a cool spy caper with a great cast.